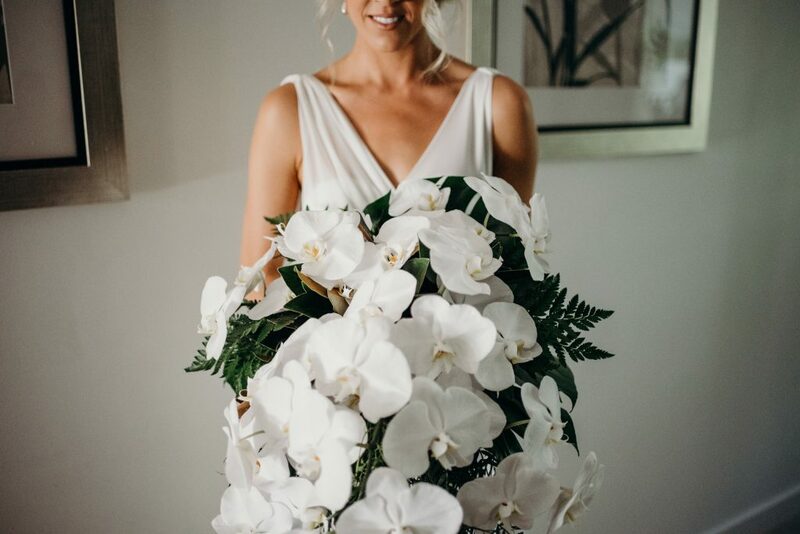 Last season I worked alongside Bec from Maid Of Honour weddings to create these florals for the gorgeous Lauren and her groomie Jamie for their Palm Cove wedding. Bec curated the entire soiree from the ceremony at the Alamanda Chapel to the reception at the irrepressible Nu Nu restaurant. These 2 Palm Cove wedding venues are side by side, so the time it takes post ceremony to have a chilled glass of bubbly in hand is rather quick. Lauren’s bouquet was a season highlight. Those Phalaenopis orchids are so delicious to work with, and as much as it looks it, it wasn’t very heavy to hold, and i think the size worked well with her stunning dress. The girls held more demure bouquets of foliage dense designs with just a pop of white. I liked this direction as the green really looked amazing against those gorgeous dark dresses…ps the pic of the bridal party looks like its straight out a magazine shoot…keep scrolling down. The images of this wedding are by Luminosity Film Studios and they are stunning. The reception at Nu NU featured the glorious hanging foliage installation. These structures can be hired through Eventcore who are amazing at what they do. These were first utilised at a wedding at Nu Nu last season for the first time and they remain a firm favourite for clients. 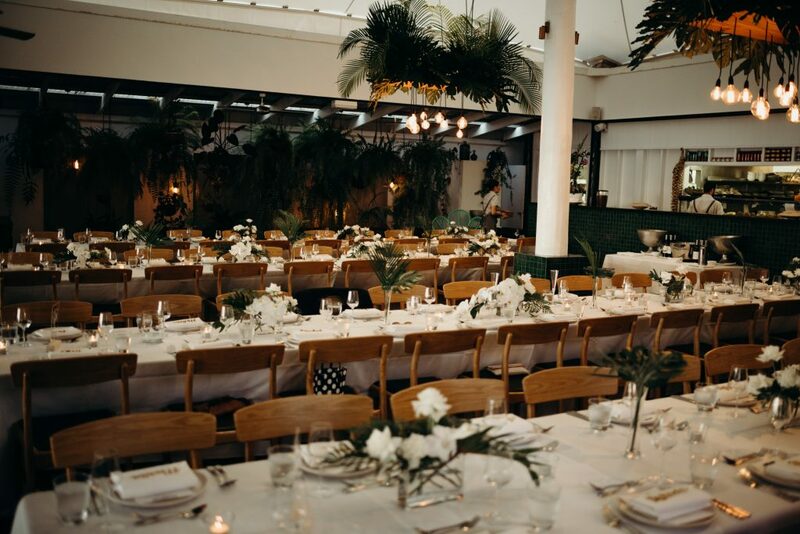 For Jamie + Lauren, they featured elongated palm leaves and monstera leaves…Always a winning combination. IMO. The tables featured white roses and white orchids with foliages touches throughout to add interest and height. Firm clear glass vases were used. These are a perfect shape for the longer table styles…and I love getting the chance to use them. 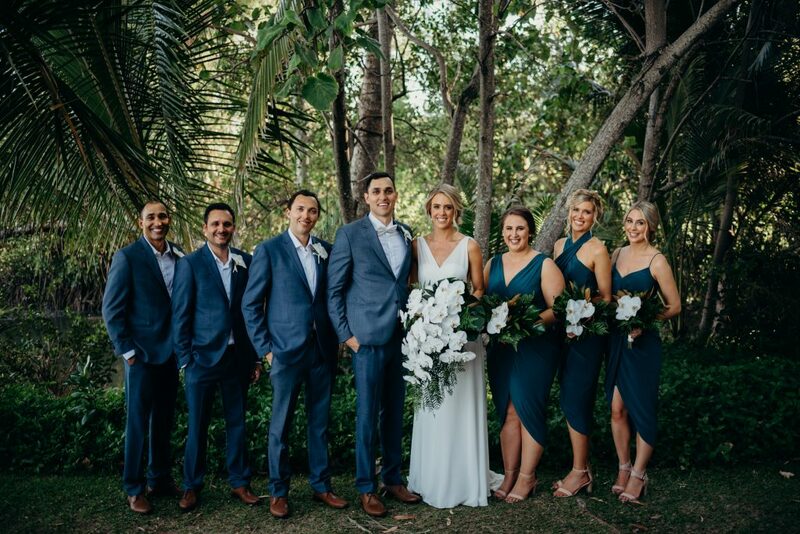 It was a pleasure to work alongside these gorgeous vendors on this Palm Cove wedding. 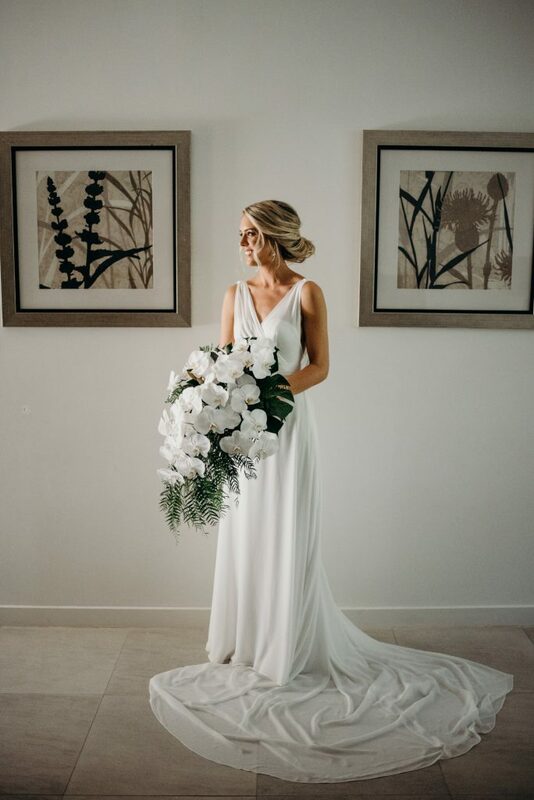 I’d love to hear from you if you require florals for your Palm Cove wedding in Queensland.